Take your level of fitness to new heights at the Darien Y by adding the functionality of rock climbing to your routine. 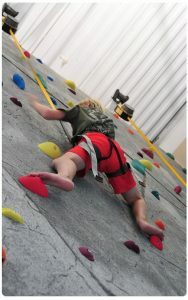 Our new, 24-foot tall rock climbing wall presents challenges for both the novice and experienced climber. It’s an excellent way to get kids moving without them realizing they’re working up a sweat! This wall is for use by adult members and non-members, children of adult members and non-members, and youth members. Member Cost: Purchase a single 30-minute climb for $10 or pay $90 for a 10-pack of 30-minute climbs. (Accompanying adult does not need to purchase a climb, but must be present in the rock climbing area). Non-member Cost: Purchase a single 30-minute climb for $15 or pay $135 for a 10-pack of 30-minute climbs. (Accompanying adult does not need to purchase a climb, but must be present in the rock climbing area). Calling all adventurers – this class is for you! Get ready to climb, crawl, and jump your way through a circuit of exercises incorporating our rock climbing wall, all designed to increase overall stamina and total body strength. The perfect fit for the child with boundless energy or for kids who aren’t drawn to organized sports. Teamwork – and a smile – are required.